Arizona Rep. Raul Grijalva (D-CD7) prompted the New York Stock Exchange to drop today, demonstrating both the awesome power that the Congressional Progressive Caucus and the CNBC hosts hold as the country inches toward the "fiscal cliff". Grijalva was on CNBC this morning. During the first 3 1/2 minutes of his interview, the S&P500 dropped from $4.04 down to $5.92 down. One of the interviewers then noted that Grijalva is stoking the fears by saying that he will not give on certain issues, and that the markets drop. "Do you care that markets are selling off dramatically?" "Of course I do," replied Grijalva. Arizona Senator John McCain (R) met with U.S. Ambassador to the U.N. Susan Rice this morning, and came out "significantly troubled" about how Rice had handled the interviews five days after the Benghazi attack and the intelligence community's handling of the run-up to that event, which took the life of U.S. Ambassador Chris Stevens and three others. The meeting had been requested by Rice, and was with Rice, McCain, Sens. Lindsey Graham and Kelly Ayotte, and a Deputy Director of the Central Intelligence Agency. The three Senators have promised to block Rice's nomination if President Obama chooses her to succeed Hillary Clinton as the Secretary of State. BOB SCHIEFFER: And joining us now, Susan Rice, the U.N. ambassador, our U.N. ambassador. Madam Ambassador, he* says this is something that has been in the planning stages for months. I understand you have been saying that you think it was spontaneous? Are we not on the same page here? SUSAN RICE: --sparked by this hateful video. But soon after that spontaneous protest began outside of our consulate in Benghazi, we believe that it looks like extremist elements, individuals, joined in that-- in that effort with heavy weapons of the sort that are, unfortunately, readily now available in Libya post-revolution. And that it spun from there into something much, much more violent. BOB SCHIEFFER: But you do not agree with him* that this was something that had been plotted out several months ago? SUSAN RICE: We do not-- we do not have information at present that leads us to conclude that this was premeditated or preplanned. SUSAN RICE: Well, we'll have to find out that out. I mean I think it's clear that there were extremist elements that joined in and escalated the violence. Whether they were al Qaeda affiliates, whether they were Libyan-based extremists or al Qaeda itself I think is one of the things we'll have to determine. BOB SCHIEFFER: There seems to be demonstrations in more than twenty cities as far as we know yesterday. Is there any sense that this is leveling off? SUSAN RICE: Well, on Friday, of course, I think that's what you're referring to-- there-- there were a number of places around the world in which there were protests, many of them peaceful, some of them turned violent. And our emphasis has been-- and the President has been very, very clear about this, priority number one is protection of American personnel and facilities. And we have been working now very constructively with host governments around the world to provide the kind of protection we need and to condemn the violence. What happens going forward I think it would be unwise for any of us to predict with certainty. Clearly the last couple of days have seen a reduction in protests and a reduction in violence. I don't want to predict what the next days will yield. BOB SCHIEFFER: The Romney campaign continues to criticize the administration. Paul Ryan was on the campaign trail yesterday saying that the Obama administration has diminished America's presence overseas and our image, a direct quote, "If we project-- if we project weakness, they come. If we are strong, our adversaries will not test us and our allies will respond to us." What's your response to that? SUSAN RICE: It's two-fold. First of all, Bob, I think the American people expect in times of challenge overseas for our leaders to be unified and to come together and to be steadfast and steady and calm and responsible and that certainly what President Obama has been. With respect to what I think is a very empty and baseless charge of weakness, let's be plain, I think American people know the record very well. President Obama said when he was running for President that he would refocus our efforts and attentions on al Qaeda. We've decimated al Qaeda. Osama bin Laden is gone. He also said we would end the war in Iraq responsibly. We've done that. He has protected civilians in Libya, and Qaddafi is gone. I serve up at the United Nations and I see every day the difference in how countries around the world view the United States. They view us as a partner. They view us as somebody they want to work with. They view President Obama as somebody they trust. Our standing in the world is much stronger so this charge of weakness is really quite baseless. BOB SCHIEFFER: Do you think Mitt Romney spoke inappropriately when he criticized and issued a statement so early in this turmoil? SUSAN RICE: Bob, I think you know, in my role, I'm-- I'm not going to jump into politics and make those judgments. That's for the American people to decide. BOB SCHIEFFER: Madam Ambassador, thank you for being with us. SUSAN RICE: Thank you very much. BOB SCHIEFFER: And joining us now for his take on all this, the ranking Republican on the Senate Armed Services Committee, John McCain. Senator, you've got to help me out here. The president of Libya says that this was something that had been in the works for two months, this attack. He blames it on al Qaeda. Susan Rice says that the State Department thinks it is some sort of a spontaneous event. What-- what do you make of it? SENATOR JOHN MCCAIN (R-Arizona): Most people don't bring rocket-propelled grenades and heavy weapons to a demonstration. That was an act of terror, and for anyone to disagree with that fundamental fact I think is really ignoring the facts. Now, how long it was planned and who was involved, but there is no doubt there was extremists and there's no doubt they were using heavy weapons and they used pretty good tactics--indirect fire, direct fire, and obviously they were successful. Could I just say that our prayers are with Chris Stevens and Glen Doherty and Tyrone Woods and Sean Smith who gave their lives. I met Chris Stevens in Benghazi during the fighting. He was putting his life on the line every day. He was living in a hotel. I was with him on July 7th when the Libyan people voted and he and I were down where thousands of people were saying to him, "Thank you, thank you, America, thank you." So the last thing that Chris Stevens would want the United States to do is to stop assisting Libya as they go through this very difficult process of trying to establish a government and democracy. BOB SCHIEFFER: Why do you think the-- is there something more going on here than a difference of opinion when the administration spokesman today says that she believes and the administration believes this was just a spontaneous act? SENATOR JOHN MCCAIN: How-- how spontaneous is a demonstration when people bring rocket-propelled grenades and heavy weapons and-- and have a very tactically successful military operation, but there are so many things that we need to cover but the fact is that the United States is weakened. And, you know, it was Osama bin Laden that said when people see the strong horse and the weak horse, people like the strong horse. Right now United States is the weak horse. In Iraq, it's unraveling. In Iraq, al Qaeda is coming back. It is in danger of breaking up into Sunni, Shia, and Kurd. By the way Iranian flights are overflying Iraq with weapons for Bashar Assad. In Afghanistan again, you just saw, the worst thing for any military morale is these killing by your allies that continue to escalate. It's unraveling because all we tell the Afghan people is we're leaving. We are not telling them we're succeeding. We tell them we're leaving. Even this morning, McCain is trying to portray Rice's September 16 remarks as being "incorrect" because she said that "it was a spontaneous demonstration", when in fact she clearly said "what BEGAN spontaneously... extremist elements, individuals, joined in with heavy weapons... and it spun from there...."
Is there a significant difference in whether it started out as an attack or whether it started as a demonstration that terrorists used to launch an attack? Was the difference significant enough for the Obama Administration and Rice to stick to what they may have already known was an incorrect intelligence report about the genesis of the attack? And, do McCain and the other Republicans reap enough benefit by ignoring the nuances of Rice's remarks and continuing to pretend that she flat out denied that it was a pre-planned attack? * "he" refers to the previous guest, the President of Libya's General National Congress Mohamed Yousef Magariaf. He had expressed that he had "no doubt" that it was "pre-planned" by foreigners who entered the country to carry out this attack. NBC News and Fox News are reporting tonight that Arizona Senator John McCain (R) will be meeting with U.S. Ambassador to the U.N. Susan Rice tomorrow. (Both note that Rice requested the meeting, which will apparently also be with Sens. Graham and Ayotte.) President Barack Obama is considered likely to nominate Rice to be the next Secretary of State, and McCain has been one of the loudest anti-Rice voices in the Senate. Tonight, McCain was on FoxNews' O'Reilly Factor, and repeatedly declined to take the host's bait and declare that Obama's likely nomination of Rice would be a "slap in the face" of McCain. He also continued his walk-back of his strident rhetoric about Rice: "I don't think it was a matter of dishonesty. It was a matter of, again, responsibility." Before the holiday (hope you had a nice one), Arizona's Politics published some observations on the final vote count. One comment generated several e-mails and deserves a quick follow-up observation. We tallied the total number of votes that Arizonans cast for the nine Democratic candidates and eight Republican candidates for Arizona's nine seats in the U.S. House of Representatives. We noted that the GOP slate received a lot more votes, but that the Democrats go to D.C. with a 5-4 delegation edge. We suggested that that outcome is not that surprising when recalling how upset Republicans were about the districts set up by the IRC. One e-mailer thanked me for backing his or her claim that the GOP got screwed, and another basically told me that that was just the way the ball bounced. The Republic ran a lengthy article on Saturday on the numbers, and gathered some interesting comments from winning Congressmen and others. The bottom line can be looked at like this: there are six "noncompetitive" districts. The GOP holds a baseline 4-2 advantage, which is more than they would deserve simply based upon the registration numbers. The three competitive districts could/would - especially, in a Republican wave election - result in a 7-2 GOP-dominated delegation. In a Democratic wave - almost like the one this year - it can result in a 5-4 Democratic advantage. Anything in between could also happen. If a Democratic wave election could result in a 7-2 Democratic-dominated delegation, that would be wrong. But, it cannot. It would seem to Arizona's Poltics that any Republicans comlpaining about this year's result are basically admitting that they cannot and will not be able to win those three swing districts. Even though - as the Republic points out - registered Republicans outnumber registered Democrats in two out of those three districts. A self-defeatist argument that none should try to make. Yesterday, Newt Gingrich, former Republican frontrunner for the GOP 2012 Presidential nominee and former Speaker of the U.S. House, indicated that he has "no idea" if he will run for President again in 2016. And, an e-mail today from his campaign-turned-marketing-machine gives us the reason: there may not be an election (or, not a fair one)! Today's e-mail is provocatively-titled, "THE SECRET BEHIND OBAMA'S THIRD TERM." The "From" line notes that it emanates from "Newt 2012", although a disclaimer notes that the opinions belong to the advertiser and not the "Newt 2012 Campaign". Gingrich is obviously not sure either whether there will be an election in 2016, or whether it would be winnable to go up against the surprisingly-powerful Obama. Interestingly, there is evidence that the Gingrich campaign is well aware of Mr. Stansberry's views. The week before the election, a previous Stansberry-via-Gingrich e-mail also predicted that Obama would go after a 3rd term if he won on November 6, ABC News reported on it, and a Gingrich spokesperson said that Stansberry was not supposed to be approved to pay Gingrich for the right to e-mail Gingrich supporters under the Gingrich family of for-profit e-mail lists. Gingrich has long been noted for his conservative cause money-making efforts (e.g. "Newt, Inc."); however, selling his supporters to operations touting unconstitutional conspiracies that are in direct conflict with his Presidential "ambitions" may be taking it many steps too far. Rep. Raul Grijalva (D-CD7) fielded a half-hour's worth of questions last week on C-Span. Arizona's vote count is ready for certifying, as Maricopa County finished tallying provisionals, and a few thoughts occurred to Arizona's Politics. The statewide finals can be seen here. 1) The U.S. Senate lead for Rep. Jeff Flake kept shrinking to the final count. He ended up with a 49.2%-46.2% win (68,000 votes out of 2.245 million cast) over former U.S. Surgeon General Richard Carmona. That not-quite-majority was a bit surprising considering that the Presidential contest in Arizona favored the GOP nominee Mitt Romney over Pres. Barack Obama 53.5%-44.5%. 3) Much ink and many bytes have been spent discussing the 5-4 Democratic edge for Arizona's House delegation. Now that we have finished the vote-counting, we can look at the total number of votes Arizonans cast for Arizona's 9 Democratic House candidates and 8 GOP candidates (the Republicans failed to field a candidate in the CD7, against juggernaut Rep. Ed Pastor). While it is not a definitive statistic - the quality of candidates put up by a minority party in a district that is "safe" for the other party can vary widely - it is worth noting that Republican House candidates received approximately 184,000 more votes than the Democratic candidates. That is approximately an entire district's worth of votes; the average AZ CD saw 225,000 votes cast. That Arizona winds up with a slightly-blue House delegation seems slightly more surprising given the totals - as well as the totals of the race for President, Senate, voter registration figures, etc. But, not as surprising when one remembers the GOP howling about the redistricting maps adopted by the Independent Redistricting Commission. 4) Both Arizona Republic and Phoenix New Times columnists are noting that longtime Maricopa County Sheriff Joe Arpaio barely crossed the 50% threshold in his re-election race. Less noted is that the 50.7% mark for GOP Arpaio is EXACTLY the same that longtime Democratic Pima County Sheriff Clarence Dupnik received in the heart of Baja Arizona country. Arizona's Politics found no similar columns in the daily or weekly papers talking about the closeness there (although I will be keeping my eyes open this weekend). Given that the Democrats have a significant edge in Pima, it would seem that both big-county Sheriffs are losing some altitude among their (previously) faithful. The day after election day, I set out some of my impressions from my day and believing that most of the issues can be traced back to the elected officials in charge of running the elections at the county and state levels. The last several days of methodical vote-counting has gained much unfavorable attention around the country, and has given all of us time to think about further ways to improve the process. I am thinking that some of them will need to be addressed at the legislative level, and I will draft or help draft some possible bills that could be introduced. 1) I previously discussed the responsibilities of various parties in the process. When it came to voters, I noted that pre-election information given to voters is spotty, and that noone can expect Jane and John Q. Public to try to remember necessary information (e.g. re-registering each time you move) between elections. a) When a voter registers, he/she must be better-informed about the voting process, and what he/she needs to do. b) When the voter registration cards are sent out, each voter must be clearly informed about where to vote (where he currently lives) and whether he/she needs to update registration. c) Most importantly, every polling place should post the statutes and explain them so that EVERY VOTER can determine what kind of ballot (regular, provisional, conditional) he/she will be permitted to cast AND whether it will be counted. Currently, we rely on poll workers and - to a lesser degree - observers, political parties, media and other organizations to inform the voters. Many voters never get clear and correct information, and many of those votes (approximately one of every five provisionals, according ) will not be counted. 1. Arizona requires you to register to vote. The deadline was 29 days before the elecction. 3. YOU MUST VOTE at the polling place designated for your CURRENT residence. (Not always closest to your residence, the posted maps or our poll workers will help make sure you vote in the right place. If you do not vote in the correct place, your vote will not be counted! a) If you have moved within the past 29 days (within the county), you can vote (1) in your old precinct, or (2) a provisional ballot at your new precinct. 2) It is not reasonable for county or state elections officials to follow up with those voters who cast conditional provisional ballots (because of lack of sufficient identification at the polls); however, it is reasonable that political parties and/or other organizations should be able to follow up. Each polling place currently builds a register of voters who cast provisional ballots, and the parties' observers are able to take the "tear sheets" of this register. There would seem to be no reason that that register cannot have an additional column to designate whether the provisional was conditional or not. FOLLOW-UP: "The Disbarment That Never Happened" Followed By "The Campaign That Will Never Happen"
Call it a fortuitous confluence of evernts. Call it a harmonic convergence. Whatever you call it, it appears that a combination of events resulted in the most-wishful announcement in my memory. It was only one week ago that Arizona's Politics noted that former Maricopa County Attorney Andrew Thomas had been selected as the unlikely speaker for the Annual Meeting of the Paradise Republican Women's Club ("PRWC") this past Saturday (Nov. 10), and that they (Thomas and/or the PRWC) had wiped away Mr. Thomas' disbarment for wrongly pursuing political prosceutions, noting that he had been "exonerated." Then, on Sunday, the Arizona Republic ran a front page article about all of the people looking at possible runs for the Governorship in 2014. Thomas was not mentioned. This morning, according to Republic reporter Yvonne Wingett Sanchez, he said that he is "seriously" considering making the run and that he would have more to say within 90 days (Feb. 12, just before Arizona's 101st birthday - maybe, he meant 92 days). He apparently did not elaborate about which "leaders and citizens" have urged him to run and believe that he "would win". Minutes ago, Arizona Secretary of State Ken Bennett announced that there are still more than 630,000 early ballots and provisional ballots to be checked and counted. 459,000 of those are in Maricopa County, a significant number of which will impact the CD9 race. About 94,000 remain in Pima and Cochise counties, a significant number of which will impact the CD2 race. The National Journal just ran an update on the seven still-unresolved House races across the country. Arizona trails California in that contest, but uncounted ballots could change that. The two Arizona races still being watched are the CD2 contest between Rep. Ron Barber (D) and Martha McSally (R), and the CD9 battle between GOP nominee Vernon Parker and Dem. choice Kyrsten Sinema. The new piece of analysis that the National Journal piece brings to the table is that the last two elections for CD2 (formerly CD8, with minor changes) have both broken the Democrats' way when early and provisionals are counted in Tucson (other counties are less critical than Pima). That may very well be a pattern that indicates that Barber may re-pass McSally in the tally. Governor Jan Brewer used her SuperPAC to robocall Montana voters in support of GOP Senatorial challenger Denny Rehberg shortly before election day. In so doing, she may have violated both Montana AND federal election laws. On Tuesday, Huffington Post reported on the robocalls supporting Rehberg in what proved to be an unsuccessful effort to unseat Sen. Jon Tester. Tester's campaign had posted the audio of Brewer's appeal on Election Day, along with scrolling text with the Montana law banning robocalls - even in the context of political races. Huffington Post notes that the Montana law banning election-related robocalls is not being enforced because prosecutors do not want to risk it being found unconstitutional. Federal elections laws require any last minute independent expenditures to be disclosed within 24 hours of the expenditure. That law is enforceable. As of this writing, JanPAC has not disclosed the Montana robocalls. It is possible that the eponymous SuperPAC did not need to file a 24-hour report with the FEC, if the expenditure was less than $1,000. A call to the JanPAC spokesman is out, and we will update upon receiving a response. An interesting sidebar to the Governor's robocall is that it came fast on the heels of Sen. Tester taking a full-page ad out thanking and praising Arizona Senator John McCain (R-AZ) for fighting against the Citizens United Supreme Court decision permitting big money SuperPACs like Brewer's. (McCain had come to Montana to campaign for Rehberg. I will be able to go into more detail later, but for now, here are a few notes on the process of elections. I was involved in election day in a few capacities, which allowed me to look at the process in both partisan and non-partisan ways, and to speak with (and, educate) a number of voters and would-be voters. In addition, I have experienced past election days in a few other capacities. Channel 12 (and other media outlets) were reporting last night on the large number of provisional ballots, and speculating on whether it was because of problems with the election system. The answer is certainly that there is are issues enough to go around, but that they all can be traced back to those elected officials who are in charge of elections at the county and state levels. Election workers: These folks work a super-long day with a minimal amount of training for LESS THAN MINIMUM WAGE. Even so, most of them are quite conscientious and quite capable. Those who are less so are usually able to perform their one-day duties when they are well-supervised by the inspector (the most responsible member of the polling place crew). The inspectors I worked with yesterday were all up to the task of running a smooth polling place. But, that does not matter when the polling place is turned into a chaotic site because of problems outside the inspector's control. Such was the situation yesterday at the polling place handling ASU dorm residents - and many non-college students who live near the campus. For a variety of factors, including apparent pre-election issues with the Maricopa County Recorder's Office's handling of students' registrations, extremely large numbers of provisional ballots (conditional and not conditional) had to be processed. This led to long waits for the more time-consuming process, which caused the small church room to be completely filled, with lines snaking around inside the room and much of the parking lot. The County was unable or unwilling to add poll workers to make it run more efficiently, although poll observers sent by the Republicans and the Democrats apparently did step in and volunteer as the crisis worsened. Under the pressure and with insufficient training and preparation (for the student issues), the poll workers inevitably made errors and/or were unable to effectively communicate issues to the voters. This has led to hundreds of provisional ballots with many students who now need to visit an election office or sub-office (e.g. Tempe City Clerk) within the next few days to prove their dorm (or, apartment) residence. Voters: Many voters in this very mobile society are completely unaware of the basics of how and where they need to vote after they move, for example. The terms "provisional ballot" and "conditional provisional ballot" sound scary and often go unexplained. True, the laws and rules can be confusing, but there ARE ways that the rules could be better explained. For many voters, this process only happens once every four years; they are not going to waste brain cells to try to remember from election to election, and the information conveyed before the election is spotty. (2) The Arizona Republic yesterday correctly told readers not to mail their early ballots; however, they then reported that you need to "take it to your polling place." This ignores the much more convenient option available to those thousands of voters - that they could bring it to ANY polling place in the County (or to the County Elections Offices). I spoke with two separate people yesterday who wanted to cast ballots at the polling place near their workplace or school, on the basis that they were not going to be near their home for the rest of the day; that holds true for early ballot-totin'-voters, too. We must demand better of ourselves and our elected officials. Americans for Responsible Leadership ("ARL") was in the news this morning for finally releasing information about where it had received its money to pour $11 Million into defeating California ballot propositions; tonight, it will be in the news for spending $2.65 Million today on last minute robocalls attacking President Obama and in favor of Mitt Romney and Republican Senate candidates across the country. The $2.4 Million spent on the Presidential race today nearly doubled ARL's investment in that tight race, to nearly $4.9 Million. Most of those phone calls are originating from here in Phoenix, with approximately $2.4 Million paid to Phoenix-based Direct Response, LLC. Direct Response is owned by Jack Padovano and partner Phillip Baker, and is located near the 101 and Beardsley. Rep. Jeff Flake was the beneficiary of only $6,817.10 worth of phone calls in this go-round, approximately doubling the amount ARL has expended on the campaign. (UPDATE, 5:45pm: The Flake campaign has sent to media a detailed refutation of the known instances of incorrect polling place information. Most show that there are Republicans and Democrats with the same phone number (in their voter file) but different addresses. This is a legitimate situation, using as an example where a child registers while they live at home with their parents, and later moves without correcting the phone number (not required). However, the examples also show that the Flake campaign could have - and/or should have - avoided many of these misleading robocalls by either inserting the targeted voter's name into the message, or by having the computer check the phone number for address discrepancies and not call those. Both solutions would take additional programming or capabilities, but one (or, both) should have been incorporated given the serious consequences of directing voters to incorrect polling locations. The Jeff Flake campaign has issued its response to the reports - and, the freshly-announced FBI investigation - regarding Flake robocalls informing voters of the wrong polling places. To recap: Channel 12 aired a report yesterday, with very specific details about multiple calls with incorrect information given. This afternoon, the Arizona Democratic Party announced that it was requesting that the FBI and other law enforcement to investigate the robocalls. The Flake campaign then lists a few scenarios that could have led to the incorrect robocalls. Analysis: The Flake campaign's explanation is probably legit, but insufficient. IF you are going to give voters specific info like that, you are responsible for making sure that you are giving CORRECT info. To address the "same phone number" issue, they could have included THE VOTER'S NAME in the robo-call. To address the "voters had moved", they could have included THE ADDRESS. Likewise, to address the "adult children" scenarios. The Flake campaign's experts and/or vendors KNEW (or should have known) of these possible issues. They chose to plow ahead and assume the risk, thus owning the inevitable fact that they would possibly disenfranchise voters. ANY voters, not just Democrats. Inexcusable, and much worse than the inadvertent mistakes by the County regarding the wrong date en espanol. The Hill reports that Democratic Senate candidate Richard Carmona will air a one-minute closing ad tonight during Monday Night Football. The Hill reporter describes the ad, and notes that "Carmona has run a strong campaign", but that the recent polls showing Rep. Jeff Flake ahead are " indicating the red lean of the state may be too much for Carmona to overcome on Election Day." Arizona CD1 Switches From Leans Kirkpatrick To Leans Paton, Says National Political Expert ; Also, Moves Senate To "Leans Flake"
In his final prognostications, national political expert Larry Sabato (Univ. 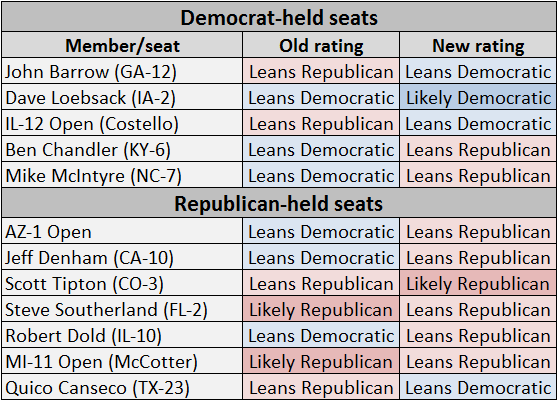 of Virginia) has moved Arizona's 1st Congressional District from the "Leans Democratic" to the "Leans Republican" column, indicating a last minute shift from former Rep. Ann Kirkpatrick to former State Senator Jonathan Paton. Sabato indicates that the change "reflect(s) late tips from our sources as well as our own instincts." He also has moved the Senate battle from "Toss-up" to "Leans Republican" - likely on the basis of yesterday's release of the Public Policy Polling results. In Arizona's other competitve Congressional seats, Sabato sees Rep. Ron Barber as a "likely" to defeat Martha McSally in CD2, and CD9 as a "leans Democratic" - favoring Kyrsten Sinema over Vernon Parker. (He also prognosticates that President Obama will wind up with 290 electoral college votes, 20 more than needed for re-election. The Paradise Republican Women's Club ("PRWC") is holding their annual meeting the Saturday after the biggest election of their lives (per Romney), and they have chosen former Maricopa County Attorney Andrew Thomas to be their Featured Speaker. Nothing wrong with that, he was not banned from public speaking - or, even public office - for life. However, you would think that they would at least acknowledge that he was disbarred (not permitted to practice law) nine days after he resigned to run for Arizona Attorney General (in 2010). The PRWC put up an updated (2012) bio of Thomas, noting that the U.S. Department of Justice "exonerated" Thomas (and Sheriff Joe Arpaio) and "specifically rejected allegations of wrongdoing that a state bar panel made against Sheriff Arpaio and Andrew Thomas." Very cleverly worded, and totally avoiding the fact that the bar panel adjudicated those "allegations" and found them troubling enough to disbar Thomas; Thomas chose not to appeal the nearly-unprecedented action. Arizona Political Money Group Turns Over Donor Info To California; Campaign Money Laundering? Arizona-based Americans for Responsible Leadership ("ARL") this morning turned over the source of the $11 Million it sent to California to oppose ballot measures there. It indicated it came through "Americans for Job Security" from the "Center to Protect Patient Rights". California's campaign watchdog says that is an admission that ARL violated California's campaign money laundering laws. ARL has also spent large sums of money on Arizona ballot measures, opposing both Props 121 (top two primary) and 204 (one cent sales tax). In addition, they have spent $2.4 Million supporting Mitt Romney in the Presidential race. Americans for Job Security has spent $15.2 Million opposing Barack Obama this year. Public Policy Polling ("PPP") released its final Arizona poll this morning, showing Republicans Mitt Romney and Jeff Flake leading their Democratic opponents 53%-46% and 51%-46%, respectively. The margin of error is +/- 3%, meaning that President Barack Obama's deficit is outside the margin, and Richard Carmona's is within the margin of error. The numbers have closed two points for the President since the previous poll, while Flake went from two points down to five up. Interestingly, the number of people identifying themselves as liberal ("very" or "somewhat") vs. conservative moved towards the conservative end of the spectrum. In October, the split was 27%-43% (29% moderate); this weekend, it was 25%-45% (29% moderate). This would appear to be reconciled by noting that self-described moderates have swung heavily in Obama's favor during the past month. One month ago, the President held a 55%-41% lead among this group, and opened it up to 65%-34% in the new poll. All that analysis laid out, we will note that an automated telephone poll is obviously not as reliable as a poll that conducts live surveys. Also noted is that we do not know how they determined who is "likely" to vote, and we do not know whether any cell phones were included in the survey. The GOP nominee for the very competitive CD9 race has declined to comment on why his non-profit fundraising organization which shut down earlier this year has failed to file required IRS disclosure reports, and whether or not he received compensation from the organization. Vernon Parker was the Chairman and public face of a free-lancing (read: not authorized or affiliated with) pro-Sheriff Arpaio organization since 2010. In his capacity, Parker sent out numerous e-mails to raise money and support, and he did raise $114,916 in the last four months of 2010. However; "Defend Sheriff Joe" failed to file the required IRS returns at least twice in 2011 and at least once in 2012. Those reports would detail the contributions he received from across the country and where the monies went. "Defend Sheriff Joe" was formed in the autumn of 2010 by Parker to "defend Sheriff Joe's reputation against the Obama administration's effort to stop enforcement of our immigration laws and to change elected officials so that more representatives are elected who are willing to enforce our laws and support the police on the front lines." Parker is listed as the Chairman, a former member of Nathan Sproul's Lincoln Strategy Group (Gary Bae) is Director, and a California bookkeeper (Kelly Lawler) is the Treasurer. The organization collected nearly $115,000 ($114,916) in the last four months of that year, sending nearly $80,000 ($79,488) of it to the Lincoln Strategy Group. It filed all of the necessary reports that year. However, even after the 2010 election cycle was over, the 527 group (a political organization exempt from paying taxes, operating pursuant to Section 527 of the Internal Revenue Code), Defend Sheriff Joe continued to actively raise money. Arizona's Politics wrote about DSJ's efforts to convince Arpaio to run for the U.S. Senate seat that Jon Kyl (R-AZ) had just announced that he would not seek re-election to (in February 2011). That was followed up by a report noting that the "pre-Valentine's Day money bomb" raised nearly $20,000 in one weekend (and in small contributions). The IRS requires that all 527 file monthly or semi-annual disclosure reports in odd-numbered years, and quarterly or monthly reports in even-numbered years. Arizona's Politics reached the Treasurer of Defend Sheriff Joe - she had prepared/signed the previous reports; she asked for an opportunity to look up the information and have someone get back to me. On July 10, Arizona's Politics published the report about the delinquent reports; the next day, DSJ filed a termination report with the IRS, backdating the termination to January 2012. 1) Did Mr. Parker receive any monies from this organization - either directly or indirectly (through Lincoln)? 2) If so, when and how much? Of course, there is nothing wrong with Parker chairing a political organization to Defend Sheriff Joe. There would be nothing wrong with him receiving compensation for his fundraising and defending efforts (the reports that were filed detailed no "defending" efforts). Arizona Governor Jan Brewer sent out a final mailer yesterday on behalf of Rep. Jeff Flake in his bid for the U.S. Senate seat from Arizona. Her eponymous SuperPAC, "Jan PAC", spent exactly $25,000.00 on a mailer, and filed the FEC report early this morning. Unfortunately, the filing notes that she has now spent nearly $225,000 on the competitive race to replace Sen. Jon Kyl; she previously (Oct. 24) filed that she had spent $100,000 on another mailer for Flake in his battle with Democratic nominee Richard Carmona. Either she did not file another $100,000 expenditure, or there was an error on today's filing. The Governor has now spent $276,993.20 on mailers supporting the Republican candidates in the Arizona Senate race and the three competitive House races. She has collected large contributions from around the country, including a $110,000 check from Copart and its owner. Arizona's Politics reported on the Texas fundraiser that was partly funded and/or hosted by a major payday lender that maintains a chain of title loan shops and check cashing offices in Arizona (as well as Ross Perot, Jr. and a Texas lawmaker who has close ties to the payday lending industry). Shortly after receiving $35,000 from that fundraiser, Jan PAC sent out a $35,567.15 mailer attacking former Rep. Ann Kirkpatrick, who has tried to nickname her GOP opponent Jonathan "Payday" Paton for his connections to the payday lending industry. PBS Newshour aired a 6 1/2 minute report tonight on Arizona's very competitive race for the U.S. Senate seat being vacated by Sen. Jon Kyl. Their reporter spoke with both Rep. Jeff Flake and Richard Carmona, as well as devoting more time to informed supporters of each. A large part of the time is devoted to analyzing efforts to reach Hispanic voters. Major conservative SuperPAC "60 Plus Association" is sending $200,000 to Tucson television stations in this last week of the campaign, hammering Rep. Ron Barber before the Tuesday election against GOP nominee Martha McSally. Their filing with the FEC this evening indicates that the money was spent yesterday, and that it brings their total spending on the race to more than $350,000. Arizona's Politics loves Bruce Ash, one of Arizona's two National Committeemen to the Republican National Committee. But, it was just coincidental that Committeeman Ash had just Facebook posted his thanks that the Catholic Bishop in Illinois ordered priests to read an anti-Obama letter this Sunday, and I then spotted an Independent Expenditure filing by The Catholic Association. This group - which is not (directly) affiliated with the Catholic Church - is robo-calling (and live calling) Catholics to oppose Obama. The new expenditures are $51,000, and they have now spent more than $200,000 in the campaign. The Catholic Association's mission statement includes the following sentence: "Partisan politics is what divides many Catholics -- we want to focus on what unites faithful Catholics in order to build a powerful coalition to positively influence our world." The campaign ad most-sighted (by our open panel of ad loggers) is the Majority PAC's spot attacking Rep. Jeff Flake's uranium mining connections. That omni-present ad just got a major new boost from co-funder League of Conservation Voters. Their FEC filing this afternoon notes that they are adding an estimated $304,000 to keep the spot playing on Arizona TV's. That brings LCV's investment in the Carmona candidacy to $770,929.85. Well, actually that is the total for their Victory Fund. The LCV itself also spent $19,547.51 yesterday on staff time and "field campaign consulting", bringing that entity's spending total to $696,576.91. Total total LCV spending: $1.4 Million. The National Republican Senatorial Committee ("NRSC") just filed a (late) report with the Federal Election Commission that it spent $778,794.27 for advertising in the last 10 days of the Flake-Carmona battle for the Senate. In addition, on Tuesday, they spent $2,360 on production. The NRSC total is now over $4.2 Million. During the past few days, the NRSC's ad attempting to stamp Democratic nominee Richard Carmona with the "rubber stamp" label has been airing; however, given the size of the expenditure, the ad has remained relatively low on Arizona's Politics most recent "As Seen On TV" lists.